weekend mornings are made for fun breakfasts. this past weekend, we lounged around the house on saturday morning in our pajamas and made these cinnamon swirl pancakes for breakfast. 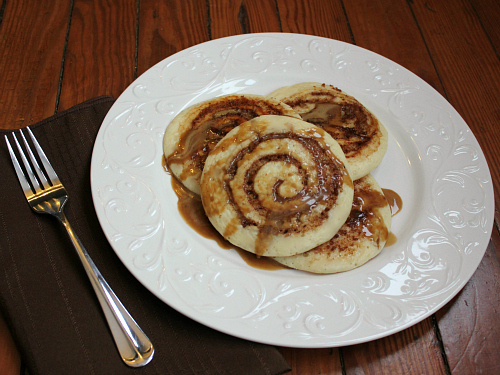 you just can't go wrong with fluffy pancakes that are swirled with cinnamon and sugar. as they cook, the cinnamon and sugar mixture melts and creates a swirled crater which is perfect for holding the warm coffee maple syrup. 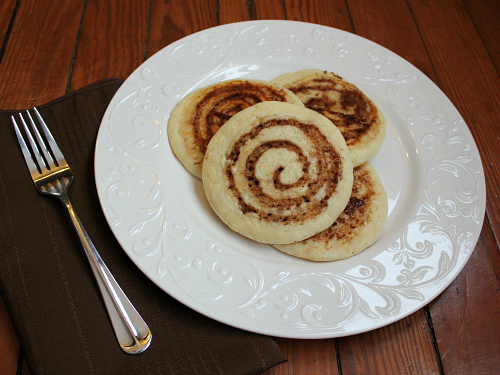 these pancakes are reminiscent of cinnamon rolls, and they are a great way to kick off a weekend morning! 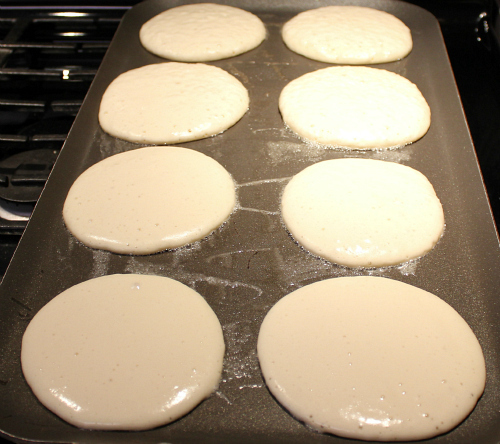 to make the pancakes: sift the flour, baking powder, and baking soda into a large bowl. add the sugar, milk, vanilla, and eggs. whisk all of the ingredients together until combined. heat a lightly buttered griddle on medium heat. pour approximately 3 tablespoons of batter onto the griddle for each pancake. allow the pancakes to set up on the griddle for 2-3 minutes. to make the cinnamon swirl: stir together the melted butter, brown sugar, and cinnamon. pour the cinnamon mixture into a plastic sandwich baggie, seal the baggie, then use a scissors to make a small snip in the bottom corner of the baggie. 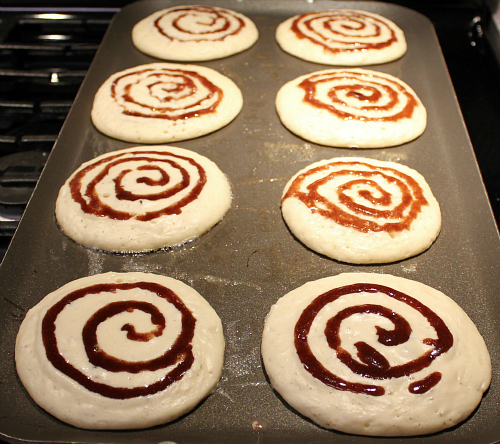 push the tip of the baggie into the batter, and gently swirl the cinnamon mixture into the pancake batter. use a spatula to flip the pancakes over and cook for another 3-4 minutes, or until the pancakes are cooked throughout. to make the syrup: in a microwave-save bowl, stir together the powdered sugar, instant coffee, heavy cream, and maple syrup. add a few teaspoons of water as needed to loosen the mixture. microwave the mixture for about 15-20 seconds in order to melt the instant coffee granules. serve warm. Not only does it sound good, it looks pretty also.